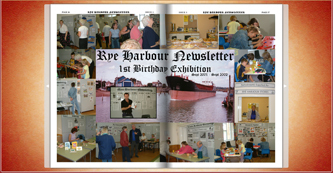 Rye Harbour Newsletter was initially created to generate mainly support for projects being planned for the youth of Rye Harbour. Both the Newsletter and website were produced on a totally voluntary basis, any funds raised from this site or from advertising within this site and the Newsletter are ploughed straight back into Rye Harbour Newsletter and Website plus making up short falls in funding of the projects. The site and newsletter are produced to be as informative as possible any and all information within the site and newsletter was sourced via permission from other sites or individuals, many articles in both were written and submitted by local residents and was deemed to be true and accurate at the time of publishing, however details do change from time to time which Rye Harbour Newsletter cannot be held responsible for, but if you notify me of any changes needed I can update the information generally within twenty four hours. Thank you and supporting us throughout this time, we achieved a considerable amount within this time to the benefit of Rye Harbour Youth. Conversion of the newsletters into Flipbooks is a little slow, however year 7 is done and the majority of year 6 except Issue 1&2, also Issue 1 is complete, if you click on the thumbnail of the newsletter it will open in the Flipbook.